Isabel Barber MFA 2017 was the recipient of the 2017 Hohenberg Travel Award. We asked her to share with us her experience. 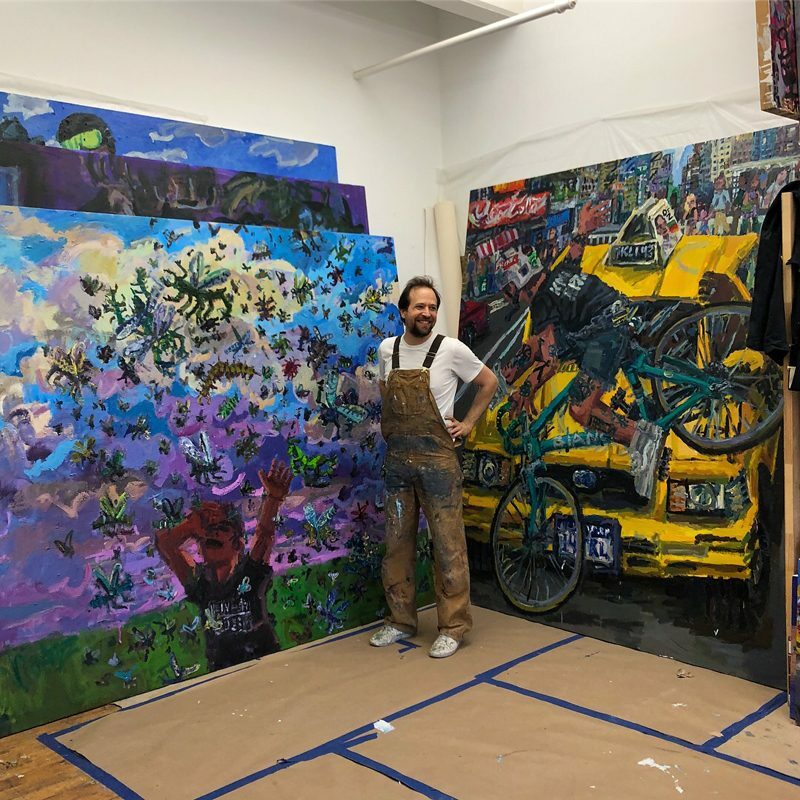 New Paintings by Isabel Barber will be on view in the New York Studio School Lobby, January 13-19, 2018. 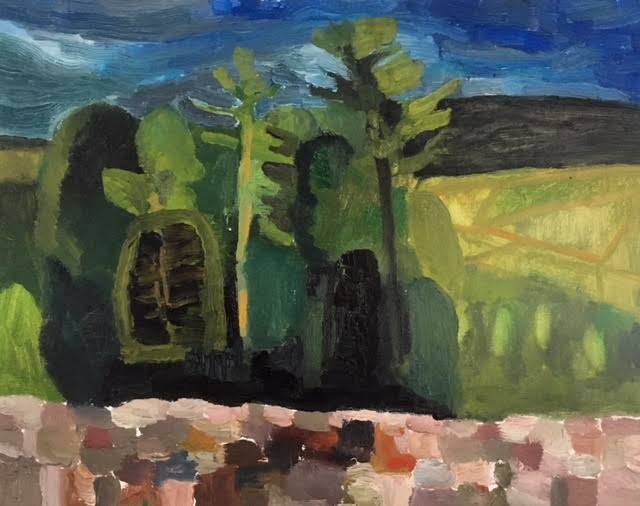 Reception with the Artist on Wednesday, January 17, 6-8pm. For six weeks this past summer I traveled through Western Europe thanks to the Hohenberg Travel Grant. I was eager to dive into art history and travel back in time; to step away from New York’s relentless movement (and this country’s reckless lurching) and visit the places where western art history began—to see the foundations of painting. With combined moments of stillness and silence, I found the Dutch to be reserved, yet intimate. But that quiet served to sharpen the senses. 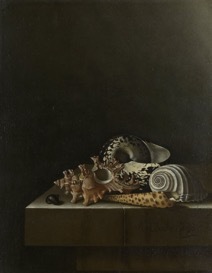 Still lives by Adriaen Coorte—small and intense paintings of fruit, vegetable or shells on a ledge, surrounded by a deep darkness—had an intense silence that left my ears ringing. There’s a subtle but insistent materiality in Dutch painting—a seemingly profound interest in the sensory experience. 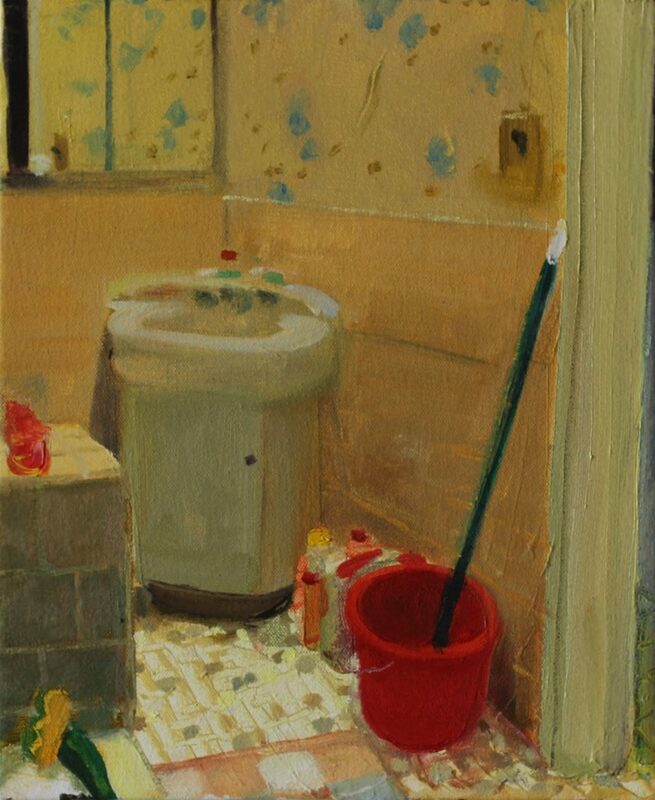 Not to superficially copy its subject, but to strive to capture something essential about the subject in the paint. I found Vermeer to be full of light and rich in textures. If you only knew Vermeer through a reproduction in a book, you might be forgiven for thinking they were photorealistic. And yet they couldn’t be further from a glossy photograph. 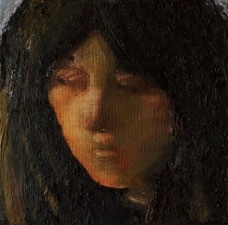 In person, so much of the power in his paintings comes from the texture of the paint. 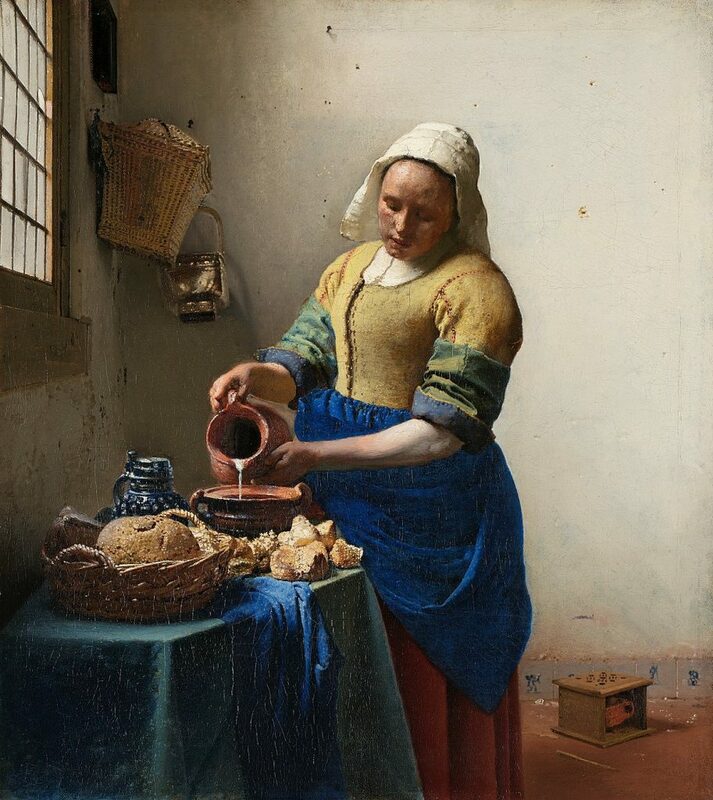 In The Milkmaid, the light that spills through the room is met by her solid form and the room’s quiet stillness is broken by her movement. 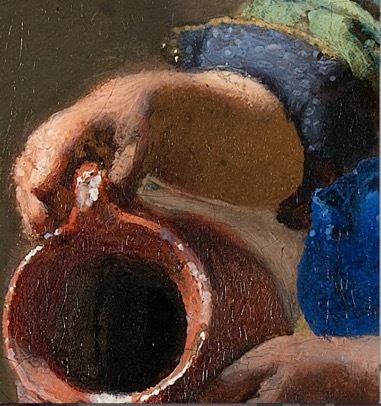 Note the quickening mark of paint below her arm as she tips the jug. Rembrandt’s Jewish Bride, the thickest painting of the 17th century, was all about touch—the touch of the hands and the feeling of embrace. 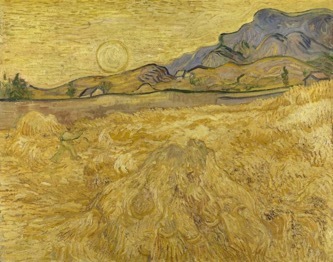 In front of Van Gogh’s wheat fields I felt the smell of thick late summer and his yellow waves of heat. 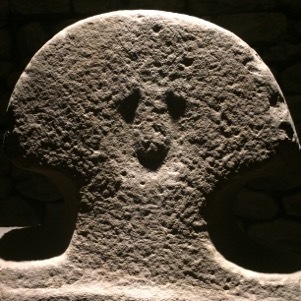 While the Dutch were reserved and inward-looking, the Spanish were outgoing and dramatic. My trip coincided with the World Pride Parade, which would take place a few blocks from the Prado, and 3 million attendees were welcomed with open arms – and rainbow flags on every street. Men in tight leather chaps sauntered down the avenue. 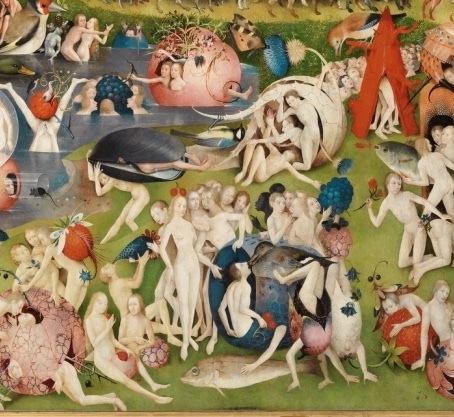 On my morning walk to the Prado, a few sleepy partyers were walking home in choice outfits- one man bare-chested in a bright yellow mini skirt with a rubber ducky attached to the front. But the festivities on the streets were matched by the intensity in the paintings hanging on the museum walls. 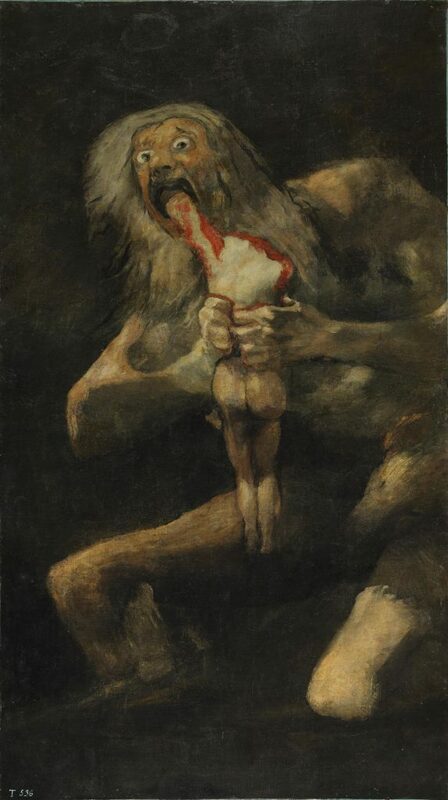 The Prado holds an incredible collection of Bosch paintings, and many powerfully haunting works by Goya, but it was Velazquez that I spent the most time with. In him I found an expert orchestrator. Painting is a performance and an arrangement. While Rembrandt’s approach is rough and earthy, Velazquez’s paint is like butter, skillfully spread on the surface of the canvas. 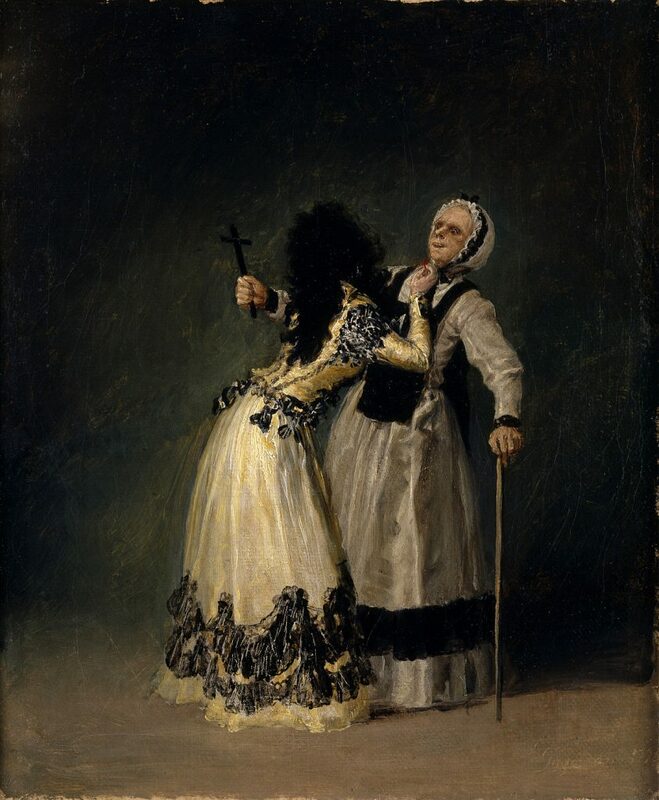 There is an intriguing psychology in Velazquez’s court jesters. 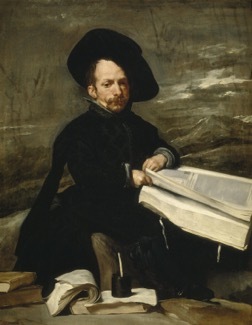 A portrait of Don Diego de Acedo, Don Diego, a dwarf court jester, is painted with a large book—clearly accentuating his small size while at the same moment hinting at his knowledge and his dignity. The wise, powerful expression on his face suggests he knows his situation—his role—all too well. 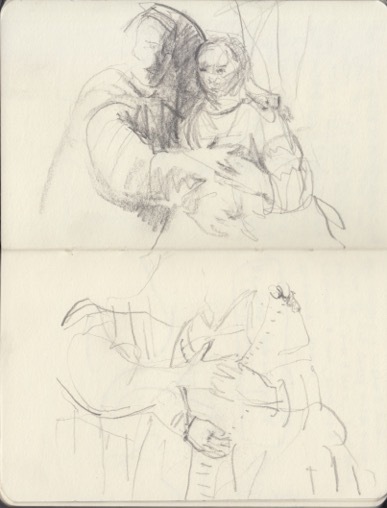 So much of Velazquez’s work is about seeing and being seen. 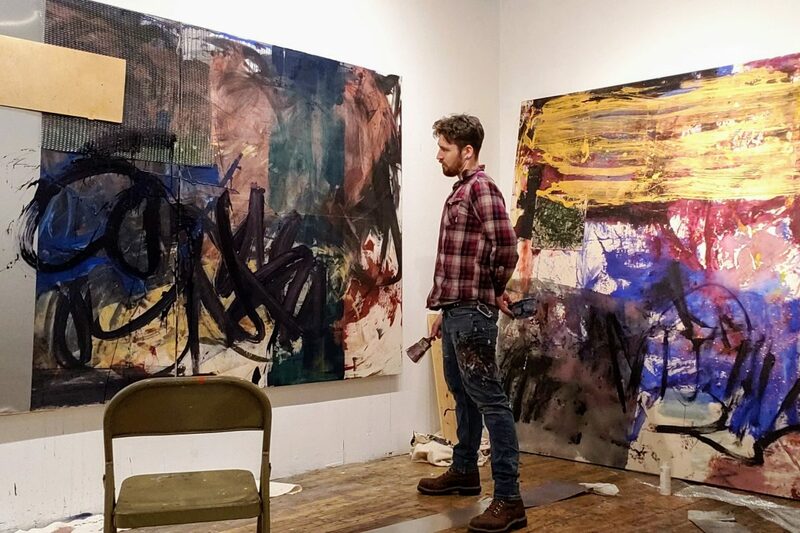 For him, the canvas seems to be the place of performance and reveal. 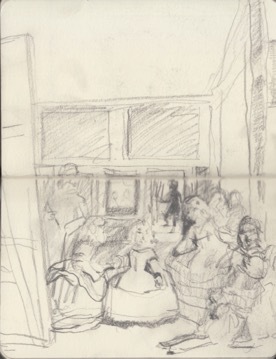 Of course, I couldn’t visit the Prado without seeing Velazquez’s biggest performance: Las Meninas. 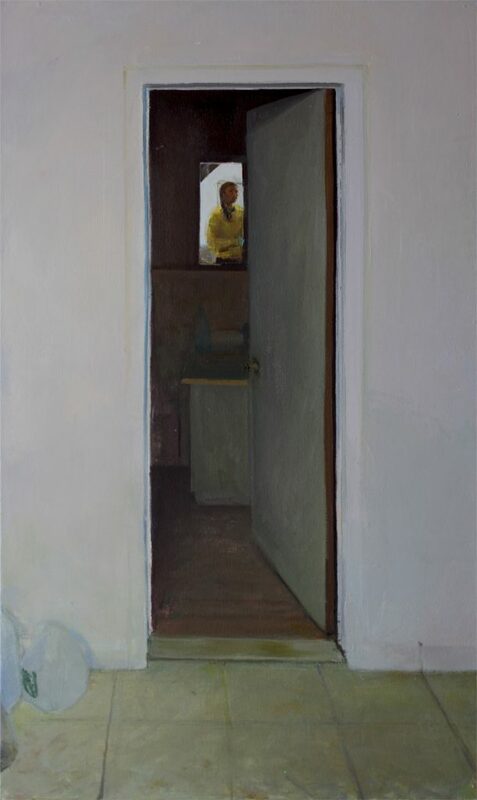 In Las Meninas, Velazquez shows us his power as the arbitrator of what is seen and what is not seen. It is a musical composition that moves you in and out, a painting that catches everyone in a moment, un-posed. The effect leaves the viewer keenly aware that there is something left unpainted outside the frame of the canvas. It’s also a moment when the artist inserts himself into the royal portrait, standing to the left of princess Margarita. Las Meninas is a work that I could have stared at for the remainder of my trip. I spent nearly three weeks in Italy, hoping to soak in as much as I could but fully aware of the sheer abundance of art I wouldn’t even be able to see. My main focus was the early Renaissance—when simplicity packs a powerful punch—when it was an innovation to capture observed human emotions and anchor them in their own three-dimensional space. 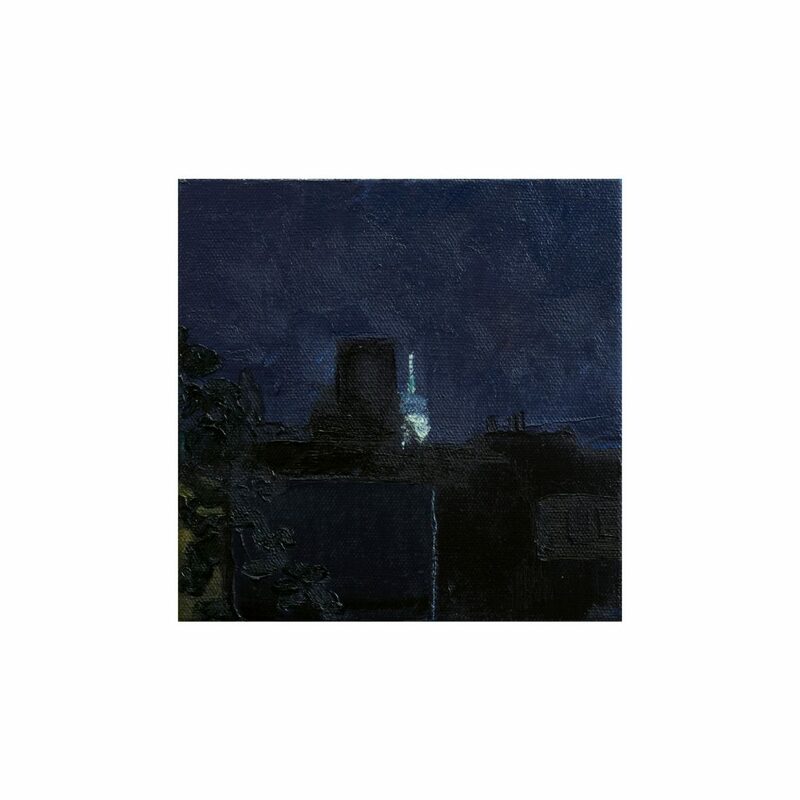 There’s something especially raw and vital in the work from this time period, before artists got too comfortable with the conventions of space and form that the work became rote. 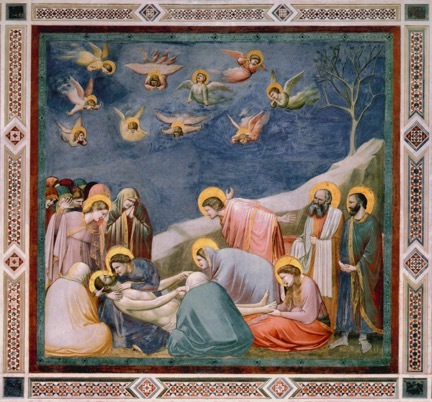 One of the most essential pre-Renaissance works is by the master Giotto at the Scrovegni Chapel in Padua. An incredible 14th century installation, the chapel houses floor to ceiling frescoes depicting the story of the life of Christ and the Virgin Mary. 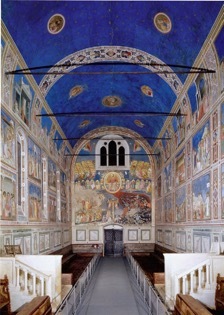 Surrounded on all sides by a mesmerizing blue that travels towards the sky and craning one’s neck around the chronological panels of stories, walking into the chapel is an all-encompassing experience. People are tenderly formed solid bulks of mass, convincingly present and locked into the frames; linked to the mass of color or heap of rocks forming the background. Their faces—simply but powerfully rendered—convey an exciting and dramatic range of emotions. The Lamentation of Christ reads like a film scene, moving you around through the variation of grieving gestures and agitated angels. 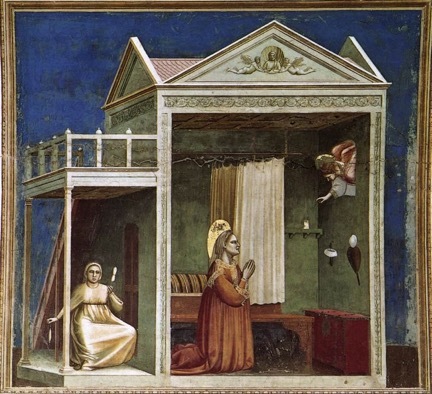 There are also quiet moments—in the panel of the Annunciation to St. Anne, when the angel enters the window of Anne’s bedroom to tell her of the future birth of her daughter Mary, a woman spins on the left of the door, framed by thin pillars—simple but enigmatic, strange and memorable. 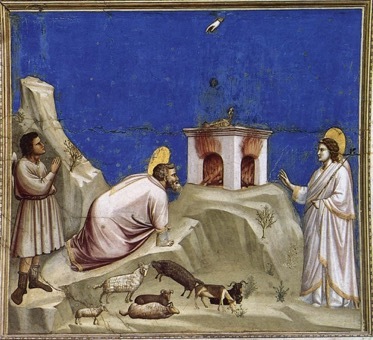 It’s as if Giotto knew his imagery had to stand the test of time. These intense works are why I went to Italy: to experience the unique and robust images from a different time. Unexpectedly, though, I ended up going even further back in art history than planned. While traveling through Tuscany, in a beautiful area known as Lunigiana (the land of the moon) I stopped for lunch in the small city of Pontremoli. 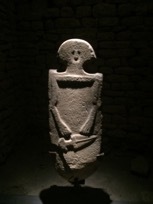 There I happened upon the Statue Stele. 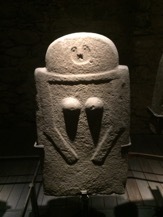 These stone statues, simply carved with basic features and just the indication of a person, were made in the Bronze Age, some as early at 3,000BC. 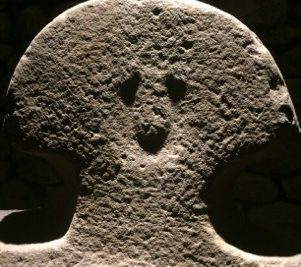 There is little known about what they are or why they were made—but their human presence is shocking. 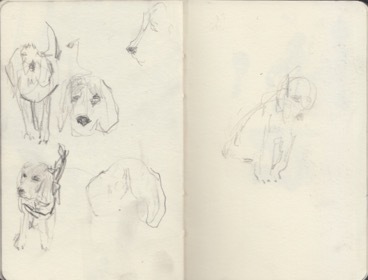 They confirm in me an ingrained desire to depict people and our visceral reaction to human forms. In their weight and simplicity, these thick and clunky sculptures were the perfect pairing for Giotto frescoes—in which each figure has a solidity and emotional presence, held in a simple but tangible space. View more of Isabel’s work on her website.